I admit, I am a self-professed neat and clean freak. Seriously, I give my kitchen a good overall cleaning every 3 days like clockwork. In between those overall cleanings, I am cleaning up things as they happen. For me, it is extremely important to keep my kitchen and all bathrooms extremely clean. I think one of the reasons I an fanatic about keeping things clean is my past history as a retired healthcare professional. I know how easily germs can spread! On top of that, I am passionate about cooking and baking and every day I spend hours in my kitchen trying out new recipes and at times, making a royal mess! The holidays bring all sorts of household “fun” … and by fun, we mean dirty messes from post-holiday party pots and pans, sticky spills on the floor and houseguests leaving dirt and scuff marks EVERYWHERE. * I love cooking for the holidays with recipes from The Real Girl’s Kitchen! For cleanup, I use my favorite kitchen accessory: the Mr. Clean Magic Eraser Extra Power! It makes cleaning cookie sheets, pie pans and a million other tough jobs so much easier! * For a festive place setting, use Sharpies on glass or ceramic tiles. Wipe away with the Mr. Clean Magic Eraser and you can use the tiles over and over again! * Tackle sticky drink spills on floors and baseboard days after a holiday party with Mr. Clean Magic Eraser. I was recently sent a package of the new Mr. Clean Magic Eraser Extra Power that is 50% stronger to last longer than the classic Mr. Clean Magic Erasers. They arrived at just the perfect time because my mother and I had just finished baking 16 dozen holiday cookies, 4 fruit pies, 6 loaves of bread and a few other holiday goodies. To say my kitchen was a mess, would be an understatement. First up, cleaning up the mess we made inside the microwave oven. You all know...that is a royal pain to clean up! I added some hot water to a glass measuring cup along with 4 drops of lemon essential oil. I then microwaved that cup for one minute so that it created a lot of steam & moisture inside the microwave. I then used my Mr. Clean Magic Eraser Extra Power to wipe out the interior of the microwave. Wow...I had the entire job done in less than 3 minutes! All of the nasty greasy and cooked on mess was gone! Next...Mom and I used those handy dandy Mr. Clean Magic Erasers to clean up my kitchen counter top and stove top. Just a little bit of lemon water & the magic eraser is all that I used to get the nasty grease, oil, food debris, etc. off of my counters and stove top. It got off everything in rapid fashion with very little scrubbing. Plus, it didn't harm any of my surfaces with scratching, etc. We were able to clean the entire kitchen using ONLY one Mr. Clean Magic Eraser and it held up beautifully! Since it was still going strong, we rinsed it out and headed into the master bathroom. We have hard water and I wanted to see if it would remove the soap scum that was building up on my ceramic tile and frosted glass shower doors (see top 2 photos in the collage above). I lightly sprayed my lemon water on those areas and got busy with my Mr. Clean Magic Eraser Extra Power. Within a few minutes all of the soap scum was gone! That's right, GONE and I didn't have to use any nasty harsh chemicals to clean it! 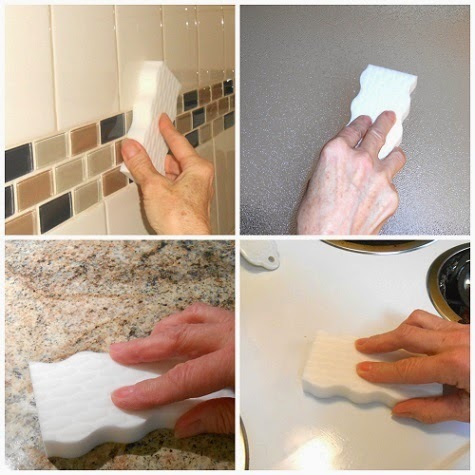 You can use the Magic Eraser on all kinds of different surfaces from textured surfaces, to glass, to plastic furniture, tile and so much more!!! They feature a contoured shape for comfort in your hands and have concentrated cleaning power to remove built-up grime. They are 50% stronger to last longer than the original Mr. Clean Magic Eraser. Got any Magic Eraser cleaning tips? Share them with @MrClean on Twitter. You can also share your tips and join Mr. Clean on Facebook. You will want to use hashtag #MrCleanMillion when sharing! Check out the Mr. Clean Clean Book for additional information and cleaning tips. I have heard a lot about the Mr Clean Magic Eraser, but have not yet tried it. After reading your review I believe more in its ability to clean and shall try the stronger version myself soon.